View all our Kanchanaburi Hotels on Google Maps. Kanchanaburi is the third largest province in Thailand after Chiang Mai and Nakhon Ratchasima. Kanchanaburi is famous in its legendary history especially during the World War II. River Kwai is one of the world most recognised historical sites where several major historical sites sit along it. Kanchanaburi is situated approximately 129 kilometres west of Bangkok. At Kanchanaburi, Kwai Noi and Kwai Yai rivers converge into the Mae Klong river, which empties into the Gulf of Thailand at Samut Songkhram. Its location at the edge of a mountain range keeping it much cooler than the other provinces of central Thailand. As said earlier, Kanchanaburi had an amazing history regarding the World War II. In 1942 Kanchanaburi was under Japanese control. It was here that Asian forced labourers and Allied POWs, building the infamous Burma Railway, constructed a bridge; an event immortalised in the film Bridge on the River Kwai. Almost half of the prisoners working on the project died from disease, maltreatment and accidents. In recent years, the area on River Kwai, Kwai Noi river in particular, gets more and more popular worldwide due to its stunning scenery where gorgeous mountains sits behind as background and the legendary “River Kwai Noi” runs through front-yard as foreground. Besides, it is all year round travel destination. In winter, the temperature could nicely go down to one digit with morning fog up on hills and above river. The weather will be cool and luckily not dry owing to Kanchanaburi’s surrounding tropical rainforest. In monsoon season, due to its perfect natural set up, rain falls only a few hours a day, unlike other areas where rain could fall almost all day long. 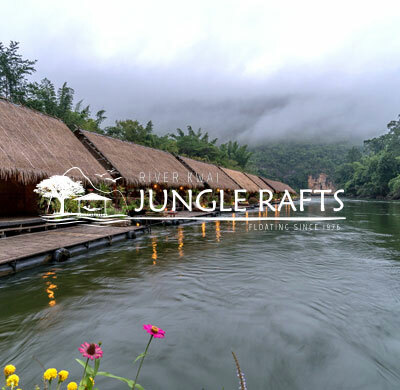 At River Kwai Noi, rain offers a refreshment and lush green atmosphere that you can smell the greenness of fertile mountainous forest. In summer, hot weather is cooled down with the fast flowing river and fresh windy on the gorge in the cuddle of mountains. There are also a wide range of activities to do, apart from memorial and museum visits, including bamboo rafting, kayaking along River Kwai Noi, river jumping, elephant riding, mountain biking, bird watching, trekking, boat trip and so forth. These assure to keep you busy and entertain all day long.